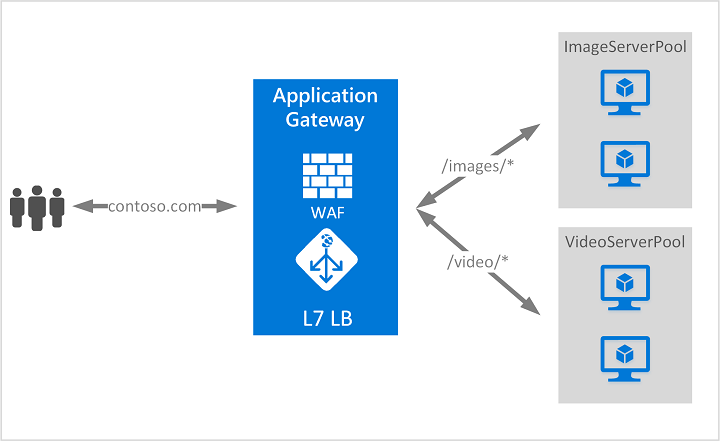 Azure Application Gateway is a web traffic load balancer that enables you to manage traffic to your web applications. Traditional load balancers operate at the transport layer (OSI layer 4 - TCP and UDP) and route traffic based on source IP address and port, to a destination IP address and port. But with the Application Gateway you can be even more specific. For example, you can route traffic based on the incoming URL. So if /images is in the incoming URL, you can route traffic to a specific set of servers (known as a pool) configured for images. If /video is in the URL, that traffic is routed to another pool optimized for videos. This type of routing is known as application layer (OSI layer 7) load balancing. Azure Application Gateway can do URL-based routing and more. In addition to the features described in this article, Application Gateway also offers a public preview of a new SKU [Standard_V2], which offers autoscaling and other critical performance enhancements. Autoscaling - Application Gateway or WAF deployments under the autoscaling SKU can scale up or down based on changing traffic load patterns. Autoscaling also removes the requirement to choose a deployment size or instance count during provisioning. Zone redundancy - An Application Gateway or WAF deployment can span multiple Availability Zones, removing the need to provision and spin separate Application Gateway instances in each zone with a Traffic Manager. Static VIP - The application gateway VIP now supports the static VIP type exclusively. This ensures that the VIP associated with application gateway does not change even after a restart. Faster deployment and update time as compared to the generally available SKU. 5X better SSL offload performance as compared to the generally available SKU. For more information about the Application Gateway public preview features, see Autoscaling and Zone-redundant Application Gateway (Public Preview). Application gateway supports SSL termination at the gateway, after which traffic typically flows unencrypted to the backend servers. This feature allows web servers to be unburdened from costly encryption and decryption overhead. But sometimes unencrypted communication to the servers is not an acceptable option. This can be due to security requirements, compliance requirements, or the application may only accept a secure connection. For these applications, application gateway supports end to end SSL encryption. The Application Gateway Ingress controller runs as a pod within the AKS cluster and allows Application Gateway to act as ingress for an AKS cluster. This is supported with Application Gateway v2 only. For more information, see Azure Application Gateway Ingress Controller. Connection draining helps you achieve graceful removal of backend pool members during planned service updates. This setting is enabled via the backend http setting and can be applied to all members of a backend pool during rule creation. Once enabled, Application Gateway ensures that all deregistering instances of a backend pool do not receive any new request while allowing existing requests to complete within a configured time limit. This applies to both backend instances that are explicitly removed from the backend pool by an API call as well as backend instances that are reported as unhealthy as determined by the health probes. Application Gateway allows you to create custom error pages instead of displaying default error pages. You can use your own branding and layout using a custom error page. For more information, see Create Application Gateway custom error pages. Web application firewall (WAF) is a feature of Application Gateway that provides centralized protection of your web applications from common exploits and vulnerabilities. WAF is based on rules from the OWASP (Open Web Application Security Project) core rule sets 3.0 or 2.2.9. Web applications are increasingly targets of malicious attacks that exploit common known vulnerabilities. Common among these exploits are SQL injection attacks, cross site scripting attacks to name a few. Preventing such attacks in application code can be challenging and may require rigorous maintenance, patching and monitoring at many layers of the application topology. A centralized web application firewall helps make security management much simpler and gives better assurance to application administrators against threats or intrusions. A WAF solution can also react to a security threat faster by patching a known vulnerability at a central location versus securing each of individual web applications. Existing application gateways can be converted to a web application firewall enabled application gateway easily. For more information, see Web application firewall (WAF) in Application Gateway). URL Path Based Routing allows you to route traffic to back-end server pools based on URL Paths of the request. One of the scenarios is to route requests for different content types to different pool. For example, requests for http://contoso.com/video/* are routed to VideoServerPool, and http://contoso.com/images/* are routed to ImageServerPool. DefaultServerPool is selected if none of the path patterns match. For more information, see URL-based routing with Application Gateway. Multiple-site hosting enables you to configure more than one web site on the same application gateway instance. This feature allows you to configure a more efficient topology for your deployments by adding up to 100 web sites to one application gateway. Each web site can be directed to its own pool. For example, application gateway can serve traffic for contoso.com and fabrikam.com from two server pools called ContosoServerPool and FabrikamServerPool. Requests for http://contoso.com are routed to ContosoServerPool, and http://fabrikam.com are routed to FabrikamServerPool. Similarly, two subdomains of the same parent domain can be hosted on the same application gateway deployment. Examples of using subdomains could include http://blog.contoso.com and http://app.contoso.com hosted on a single application gateway deployment. For more information, see multiple-site hosting with Application Gateway. A common scenario for many web applications is to support automatic HTTP to HTTPS redirection to ensure all communication between an application and its users occurs over an encrypted path. In the past, you may have used techniques such as creating a dedicated pool whose sole purpose is to redirect requests it receives on HTTP to HTTPS. Application gateway supports the ability to redirect traffic on the Application Gateway. This simplifies application configuration, optimizes the resource usage, and supports new redirection scenarios, including global and path-based redirection. Application Gateway redirection support is not limited to HTTP to HTTPS redirection alone. This is a generic redirection mechanism, so you can redirect from and to any port you define using rules. It also supports redirection to an external site as well. Global redirection from one port to another port on the Gateway. This enables HTTP to HTTPS redirection on a site. Path-based redirection. This type of redirection enables HTTP to HTTPS redirection only on a specific site area, for example a shopping cart area denoted by /cart/*. Redirect to an external site. For more information, see redirecting traffic with Application Gateway. The cookie-based session affinity feature is useful when you want to keep a user session on the same server. By using gateway-managed cookies, the Application Gateway can direct subsequent traffic from a user session to the same server for processing. This is important in cases where session state is saved locally on the server for a user session. Application Gateway provides native support for the WebSocket and HTTP/2 protocols. There's no user-configurable setting to selectively enable or disable WebSocket support. The WebSocket and HTTP/2 protocols enable full duplex communication between a server and a client over a long running TCP connection. This allows for a more interactive communication between the web server and the client, which can be bidirectional without the need for polling as required in HTTP-based implementations. These protocols have low overhead, unlike HTTP, and can reuse the same TCP connection for multiple request/responses resulting in a more efficient utilization of resources. These protocols are designed to work over traditional HTTP ports of 80 and 443. For more information, see WebSocket support and HTTP/2 support. Adding security-related header fields like HSTS/ X-XSS-Protection. Removing response header fields that can reveal sensitive information. Stripping port information from X-Forwarded-For headers. Application Gateway supports the capability to add, remove, or update HTTP request and response headers, while the request and response packets move between the client and back-end pools. It also provides you with the capability to add conditions to ensure the specified headers are rewritten only when certain conditions are met. For more information about this public preview feature, see Rewrite HTTP headers. Application Gateway is currently offered in three sizes: Small, Medium, and Large. Small instance sizes are intended for development and testing scenarios. For a complete list of application gateway limits, see Application Gateway service limits. These values are approximate values for an application gateway throughput. The actual throughput depends on various environment details, such as average page size, location of back-end instances, and processing time to serve a page. For exact performance numbers, you should run your own tests. These values are only provided for capacity planning guidance. Quickstart: Direct web traffic with Azure Application Gateway - Azure portal.